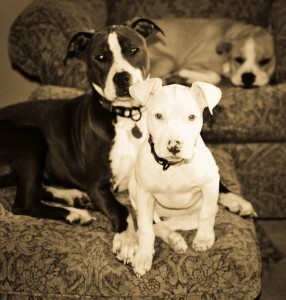 Sarah (of Pink Cricut) sent the stories of her three pit bulls, Riley, Felicity, and Zoe. They are great examples of how this misunderstood breed can be a wonderful and loving family pet. Recently, our family adopted our third pit bull. You heard me correct: we have three love-a-bull dogs who we are blessed to have in our life. Getting to three isn't as simple as just adopting Zoe—it took a WHOLE lotta persuasion. A couple years ago we bought our first home, and after having lived in it for a couple months we wanted to get our kids a puppy. So we went online and found that the Furry Friends Refuge had puppies. They were listed as "terrier/mix" so we went and saw them. When we got there, we found out that the puppies were pit bulls. Like many ignorant people we thought instantly that these pups would be terrors, and we were extremely apprehensive about adoption, but I couldn't get the sight of the kids playing with those puppies out of my head. So we adopted our first pit bull, Riley. Upon bringing her home we determined that we would get rid of her at the first sign of aggression. We are talking even a teeny growl ... or bare of teeth. Needless to say, we did a TON of research online, and we purchased several books on the breed. Everything we read said these dogs were the most loyal and gentle breed ever owned by many people. Sure, there were horror stories, but it was the actual bite data that opened our eyes. To see that Labs, German shepherds, and other common breeds actually had a higher percentage of biting their owners was alarming and eye-opening. So we worked really hard with Riley. She was a SAINT, honestly the best dog I have ever owned. She let our 2 1/2-year-old pull her tail, take treats from her mouth, roughhouse in ways that other dogs would have never allowed. She was so gentle and loving. Her favorite thing to do was to cuddle on the couch; she was quite realistically the biggest lap dog I had ever seen. Well, our lives got really busy, I started a business and the kids started school, and we were noticing that Riley was getting less and less attention. Being the trooper that she was, she never complained, but we noticed that she wanted to be inside more and more. Riley needed a friend, one that she could hang out with on a regular basis. One she could frolic, tackle, argue, and run with in the backyard. So we went to the ARL (Animal Rescue League) because we heard there was a little girl there named Felicity who was in need of a home. After meeting Felicity we knew instantly that she and Riley would complement each other perfectly. Felicity was a little spunkier by nature, but she was a lover—not an aggressive bone in her body. Riley and Felicity met and instantly wanted to go play. The ARL employee commented that she had never had an intro go so quickly and easily. Both girls behaved, and we made them sisters. Several months later, pictures were posted of a new litter of pit bull puppies on the Pit Crew Facebook page. We thought we should go visit the puppies, so we did. We met Cloud, Darma, and Zoe (then Tilly). Cloud was a little chunk, and we knew he was going to be a big boy. We decided that since we have two girls already, we should keep the female theme going. Darma was doing a doggie intro, and I had been captivated by "Tilly's" blue eyes. Her scrawny runt frame and those piercing blue eyes had me captivated. After the "Hug" room I was hooked! It took a little convincing, but once we saw all three playing together, we knew that "Tilly" was to become part of the family. So we packed up "ChinChilly," as my daughter called her, and brought her home to her almost half-acre backyard, toys, and play pals. Zoe has been a wonderful addition to our family. She has showcased how maternal Riley is and how much fun Felicity is as a big sister. 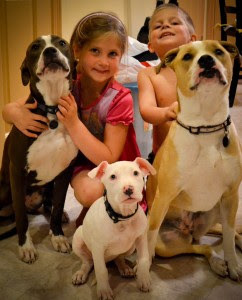 So, yeah, we have three pit bulls, and they are part of our family. It's not about their breed ... it's about their training. Love them and they'll love you, train them and they'll obey you, socialize them and they'll make you proud to be an owner of the most misunderstood breed in the animal kingdom. Awesome black & white photo of some great looking pups! I agree, pits are so misunderstood. Two of our dogs are pit mixes and they are so darn lovable & loyal. Thanks for sharing your wonderful story.